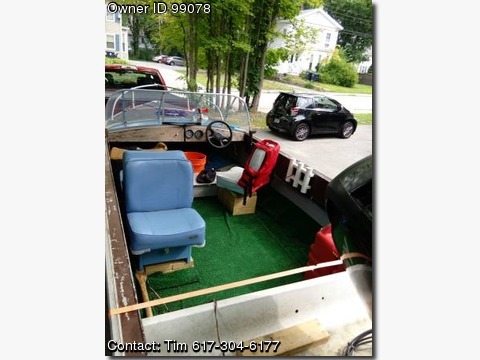 Please call boat owner Tim at 617-304-6177. Boat is located in Nashua, New Hampshire. I recently picked up some land and I am eager to get building! Unfortunately for me this means it is time to move on from my favorite ship. This is a classic hull, a 1969 MirroCraft aluminum boat with a modern trailer that has also had the axle and wheels updated for the new, heavier engine. I have all of the original documentation and history. My dad traded for this beauty and I redid everything including a rhino-lined bow for an excellent fishing position. That is a 2012 60hp 4 stroke Mercury engine. The steering wheel, dials, and connecting electronics were part of the job that ran about $9,500 by Irwine Marine. They did a great job and loved watching me take off for the water late summer 2012. With the aluminum hull and the maxed horsepower the boat has been great for fishing, enjoying a day on the lake or coastal waters. It can comfortably support 4 passengers, and still has a decent bay area for gear, or for team fishing for stripers under the Piscataqua bridge (for example). Since I&#39;ve assembled this planing monster I have used it for no more a month of day boating time. I estimate around 60 hours of motoring. I&#39;ve winterized and stored indoors for the now three winter seasons I&#39;ve had it. I also added a motor-toter with this year&#39;s winterization procedure, which is not shown. My plan was to enjoy it for a few years and then find a newer Whaler, White, or Tracker hull and switch the engine / gear over. My land opportunity has trumped this plan for the near term however and I think this is a great deal for anyone looking to hit the water at first ice out in 2015.